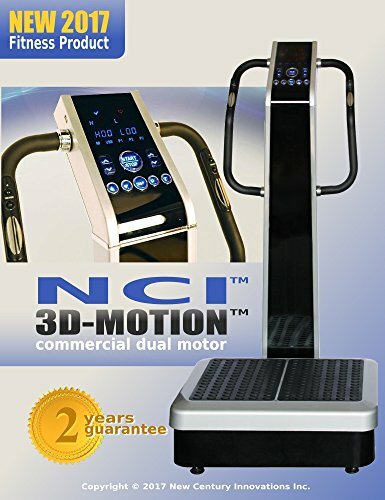 Whole Body Vibration Machine - 3D-MOTION by NCI combines altogether the best qualities of the perfect whole body vibration machine : large vibrating platform, dual quiet DC motors (2HP), commercial grade steel frame, 3600 vibration settings, 3-dimensional spacial motions. The whole body vibration technology was first invented in Russia in 1960's for training of cosmonauts to build muscle strength and stamina. Now you can have it at the convenience of your home. Just 10 minutes a day, 2-3 times a week will provide a workout equivalent to 60 minutes regular gym training! Thanks to a cutting edge 3-directional vibration technology and fully programmable training routine with built-in easy preset programs. NCI 3D-MOTION's integrated whole body vibrations make muscles involuntary contract in rapid flexes, delivering stretch-reflex stimulation not possible with conventional exercise - automatically warming muscles, joints, and increasing circulation. Three-In-One Design.A world's first, the 3D-MOTION Whole Body Vibrating Machine from NCI coordinates three automated motions in one smart, freestanding unit : Triangular Oscillation delivers regularly alternating up/down oscillation automatically engaging all major muscle groups. Regular routines speed fat burning, slimming , toning. Spiral Mode creates horizontal, smooth, elliptical motion for recovery, rehabilitation, and light workouts. Dual Mode combines both Triangular and Spiral motions in 3-dimensional spatial planes. Optimal for human fitness. Most effective for combating cellulite. Fitness, Weight Loss, Anti-Cellulite, Builds Bone Density, Relaxes Muscles, Improves Circulation, Lymphatic Drainage, Injury Rehabilitation. Large 27" Vibration Platform with Tri Motion 3D Spacial Movements. 3 Vibration Modes: Triangular Oscillation, Spiral, Dual. Dual Quiet Brushless DC Motors (500 Watt + 300 Watt) with 2HP Max Power and 5 Years Warranty. Heavy Duty All Steel Commercial Grade Frame Construction with 5 Years Warranty. User weight capability: 440 lbs. Assembly dimensions (L x W x H) : 23" x 27" x 53". If you have any questions about this product by New Century Innovations (NCI), contact us by completing and submitting the form below. If you are looking for a specif part number, please include it with your message.